Mrs. Bernice Allene (Morrow) Grimsley-Saxbury peacefully joined many of her family and friends in the presence of the Heavenly Father on October 21, 2018. 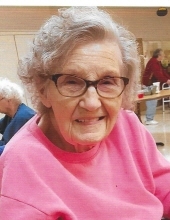 Formerly of Kinderhook and New Canton her passing was attended by her children and the wonderful, loving, and caring staff of the Barry Community Care Center. Bernice was born January 6, 1925, to Joseph Eugene and Sarah Harriet (Howland) Morrow of Atlas, Illinois and was welcomed by older brother Wilbur. She saw the arrival of eleven more siblings. Bernice married William (Bill) Grimsley on January 23, 1943, their union produced 6 children: Evelyn Eileen Bernard, William (Bill) R., Jr. (Christa) Grimsley, James Michael (Jackie) Grimsley, Sherrill Elaine (Darrel) Turner, Karen Jean (died in infancy), and Dena Carol Moyer. Having worked as a seamstress and restaurant-school cook Bernice began a new career selling Amway, Artex, BeeLine, and House of Lloyds'. She then found her joy working with children at Woodland Childrens' Home in Quincy and Presbyterian Childrens' Home in Farmington, Missouri. Her husband Bill passed away January 6, 1971. After being widowed for many years Bernice married Ben J. Saxbury on September 27, 2003. Mr. Saxbury passed away September 25, 2004. Bernice is survived by her 5 children, 12 grandchildren, 21 great grandchildren, and 5 great great grandchildren. Sisters Barbara Robinson of Louisiana, Mo., Sally Cramm of Mendon, Minnie Cooper of Meredosia, Kathy Reynolds of Barry, Judy Hinch of Barry, Rosemary Smith of Barry, and special sister-in-law Shirley Morrow of St. Charles, Mo. also survive as well as many, many nieces, nephews, great nieces and great nephews. Also, special survivors are ex-son-in-law Roger Bernard and ex-daughter-in-law Brenda Grimsley. Preceding her in death were grandson Ryan Lee Moyer, age 9, who she lovingly cared for and great grandson Jacob (Opie) Harrison, age 12, her parents, brothers Wilbur, Bill, Joseph, and Richard as well as sisters Erma Claus and infant Nancy. Bernice enjoyed the 10 Grimsley brothers-in-law and sisters-in-law and their spouses who preceded her in passing as well as several nieces and nephews. As friends, children, and family were her joy of life on earth along with a quiet and steady faith in God and his earthly son Jesus Christ, it is sure that she is looking forward to the big reunion in Heaven. Pallbearers are Brandon Grimsley, Andrew Turner, Ray Grimsley, Zach Grimsley, Joshua Harrison and Jordan Harrison. Honorary Pallbearers are Shane Miller, Dalton Malone, Dylan Bernard, Julie Wager, Rona Forbis, Susan Malone, Shelly Young, Nicole Triplett, Erin Maubach and Mary Greenwood. Special Pallbearers who carry granny in their heart as well are great grandchildren Megan Harrison-Dolbeare, Sam Jo Riley, Sam Nic Walker-Riley, Kayla Hammons, Destiny Hanlin, Desirae Wager, Cora Moyer, Jaylynn Grimsley, Celeste Grimsley, Jacob Grimsley, Amelia Grimsley, Kaleb Grimsley, Emy Greenwood, Gracie Greenwood, Quentin Maubach, Courtney Maubach, Sidney Young, and Isla Young. Great great grandchildren are Aftyn Harrison, Faith Harrison, Madison Billings, Edhan Roskin, and Judith Roskin. Visitation will be from 10:00 a.m. til 12:00 p.m. Thursday, October 25, 2018, at the Kirgan Funeral Home in Barry. Funeral services will be at 12:00 p.m. Thursday, October 25, 2018, at the Kirgan Funeral Home in Barry. Intement will be at Samuel Taylor Cemetery, Rockport, Illinois. A meal catered by Drakes' Steak and Ale, to celebrate Bernices' love of cooking and eating will be held after interment at the First Baptist Church in Kinderhook. Memorials may be made to your charity of choice or Samuel Taylor Cemetery, Rockport, Illinois. To send flowers or a remembrance gift to the family of Bernice Allene (Morrow) Grimsley-Saxbury, please visit our Tribute Store. "Email Address" would like to share the life celebration of Bernice Allene (Morrow) Grimsley-Saxbury. Click on the "link" to go to share a favorite memory or leave a condolence message for the family.